Karen Webster is one of the best writers and interviewers in tech/fintech. It’s not easy to be a retailer today when more and more people are turning to Amazon for shopping. And why not shop online? Ordering is convenient with features such as ratings. Delivery is fast and cheap, and returns are easy and free – if you are Prime member! In April 2018 Bezos reported there are more than 100 million Prime members in the world, and the majority of US households are Prime members. Walmart and Google have partnered in an ecommerce play to compete with Amazon, but Walmart is just dancing with the devil. Google will use the partnership to gather data and invest more in their internal ecommerce and shopping experiences. Walmart isn’t relaxing, and is aggressively pursuing ecommerce and AI initiatives through acquisitions, and its Store #8 that acts as an incubator for AI companies and internal initiatives. Question: why does Facebook have a Building 8 and Walmart have a Store 8 for skunkworks projects? Read more at Embedded Computing. Here’s the basic motivation that I see in creating Voice Assistants…Build a cross platform user experience that makes it easy for consumers to interact, control and request things through their assistant. This will ease adoption and bring more power to consumers who will use the products more and in doing so create more data for the cloud providers. This “data” will include all sorts of preferences, requests, searches, purchases, and will allow the assistants to learn more and more about the users. The more the assistant knows about any given user, the BETTER the assistant can help the user in providing services such as entertainment and assisting with purchases (e.g. offering special deals on things the consumer might want). Let’s look at each of these in a little more detail:…. This is part one in a three part series. Catch part two next week. Sensory Demos Awesome AI Mashup at Finovate! Finovate is one of those shows where you get up on stage and give a short intro and live demo. They are selective in who they allow to present and many applicants are rejected. Sensory demonstrated some really cutting-, perhaps bleeding-, edge stuff by combining animated talking avatars, with text-to-speech, lip movement synchronization, natural language speech recognition and face and voice biometrics. I don’t know of any company ever combining so many AI technologies into a single product or demo! 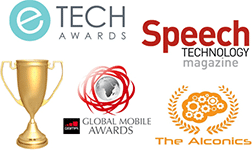 Speech recognition has a long history of failing on stage, and one of the ways Sensory has always differentiated itself, is that our demos always work! And all our AI technologies worked here too! Even with bright backlighting, our TrulySecure face recognition was so fast and accurate some missed it. With the microphones and echo’s in the large room, our TrulyNatural speech recognition was perfect! That said, we did have a user-error… before Jeff and I got on stage he put his demo phone in DND mode, which cut our audio output – but quickly recovered from that mishap. Comments Off on Sensory Demos Awesome AI Mashup at Finovate! All assistants will start knowing who is talking to them. They will hear your voice and look at your face and know who you are. They will bring you the things you want (e.g. play my favorite songs), and only allow you to conduct transaction you are qualified for (e.g. order more black licorice). Today there is some training required but in the near future they will just learn who is who much like a new born quickly learns the family members without any formal training. Comments Off on I Nailed It! Today, I say, “Just like Hey Siri, OK Google, Alexa, Hey Cortana, and so on.” Now, everybody gets it and the technology is mainstream. In fact, next year, Sensory will have technology that’s embedded in IoT devices that listens to all those things (and more). But that’s not good enough. Virtual Assistants coming to an Ear Near You! Virtual handsfree assistants that you can talk to and that talk back have rapidly gained popularity. First, they arrived in mobile phones with Motorola’s MotoX that had an ‘always listening’ Moto Voice powered by Sensory’s TrulyHandsfree technology. The approach quickly spread across mobile phones and PCs to include Hey Siri, OK Google, and Hey Cortana. Then Amazon took things to a whole new level with the Echo using Alexa. A true voice interface emerged, initially for music but quickly expanding domain coverage to include weather, Q&A, recipes, and the most common queries. On top of that, Amazon took a unique approach by enabling 3rd parties to develop “skills” that now number over 6000! These skills allow Amazon’s Echo line (with Tap, Dot) and 3rd Party Alexa equipped products (like Nucleus and Triby) to be used to control various functions, from reading heartrates on Fitbits to ordering Pizzas and controlling lights. Until recently, handsfree assistants required a certain minimum power capability to really be always on and listening. Additionally, the hearable market segment including fitness headsets, hearing aids, stereo headsets and other Bluetooth devices needed to use touch control because of their power limitations. Also, Amazons Alexa had required WIFI communications so you could sit on your couch talking to your Echo and query Fitbit information, but you couldn’t go out on a run and ask Alexa what your heartrate was. All this is changing now with Sensory’s VoiceGenie! The VoiceGenie runs an embedded recognizer in a low power mode. Initially this is on a Qualcomm/CSR Bluetooth chip, but could be expanded to other platforms. Sensory has taken an SBC music decoder and intertwined a speech recognition system, so that the Bluetooth device can recognize speech while music is playing. For example, a Bluetooth headset’s volume, pairing, battery strength, or connection status can only be controlled by the device itself, so VoiceGenie handles those controls without touching required. VoiceGenie can also read incoming callers’ names and ask the user if they want to answer or ignore. VoiceGenie can call up the phone’s assistant, like Google Assistant or Siri or Cortana, to ask by voice for a call to be made or a song to be played. By saying Alexa, the user gets access to a mobile Alexa ‘On the Go’, so any of the Alexa skills can be utilized while out and about, whether hiking or running! This third point is perhaps the least understood, yet the most important. People want a personalized assistant that knows them, keeps their secrets safe, and helps them in their daily lives. This help can be accessing information or controlling your environment. It’s very difficult to accomplish this for privacy and power reasons in a cloud powered environment. There needs to be embedded intelligence. It needs to be low power. 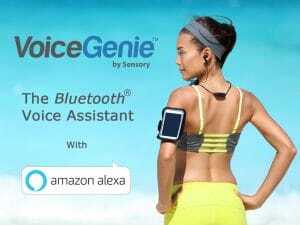 VoiceGenie is that low powered voice assistant. Comments Off on Virtual Assistants coming to an Ear Near You! I watched Sundar and Rick and the team at Google announce all the great new products from Google. I’ve read a few reviews and comparisons with Alexa/Assistant and Echo/Home, but it struck me that there’s quite an overlap in the reports I’m reading and some of the more interesting things aren’t being discussed.